Long-EZ flying above the Mojave desert in California. The aircraft is of an unusual design, having forward-mounted "canard" wings instead of a tail plane and a rear-mounted "pusher" propeller. The canard makes the plane virtually stall proof. It has a slightly steeper tilt than the regular wing; thus the canard begins to stall before the main wing, and as it does so, it drops the nose and gains speed. The Long-EZ has a range of up to 7700 kilometers, a ceiling of 27,000 feet (8230 meters) and a top speed of 309 kilometers per hour. 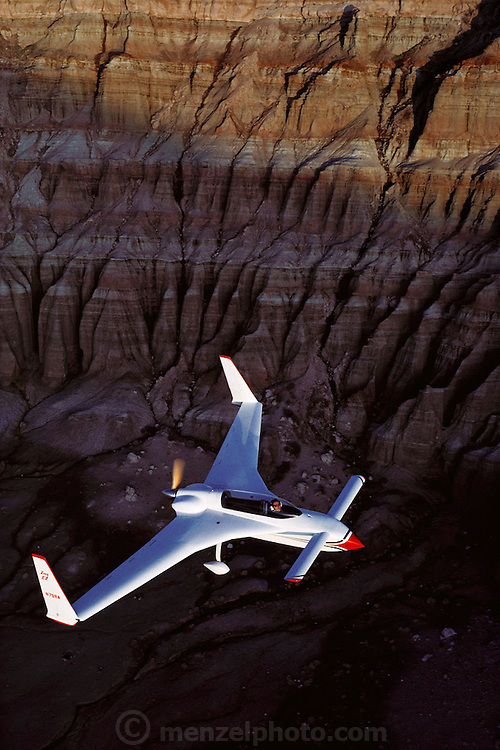 The aircraft is available in a kit form, manufactured by the Rutan Aircraft Factory, which can be assembled in as few as 1000 hours.